The Hyoho Niten Ichi Ryū Kenjutsu Dublin Kenyu Bu was founded in September 2014 after the receiving permission to open a study group for Hyoho Niten Ichi Ryū Kenjutsu from Takanori Kajiya Soke, 12th headmaster of the school on the 16th August 2014. We hold extended Yagai Keiko (outdoors practice) for 4-6 hrs the 2nd last Saturday of every month at O'Brien Sensei's home in Terenure. Places for the extended Yagai Keiko are open to all, but are very limited with only 6 slots open each month. Hyoho Niten Ichi Ryū and the Dublin Kenyu Bu share Niten under the "Dosokai’. This is the idea the "everyone is a student", thus there are no belts, no grades, no ranks. All we do is provide an opportunity to practice Hyoho Niten ichi Ryū kenjustu as was taught to us by the 12th headmaster of the style, Kajiya Soke. Paul 'Batman' O'Brien, Sandan (3rd Dan) is an instructor of Musō Jikiden Eishin-ryū (無双直伝英信流) under the International Division of the Dai Nippon Butoku Kai, Nidan (2nd Dan) in ZNKR Iaido, and Nidan (2nd Dan) in ZNKR Jodo. 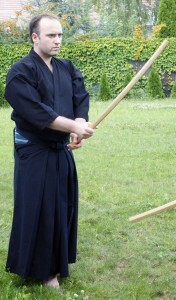 O'Brien is a direct Iaido student of Peter West, 7th Dan Kyoshi, studying the Harasuke-ha line of MJER under the direction of Oshita Masakazu Sensei, 8th Dan Kyoshi. Within Jodo O'Brien is a direct student of Elena West, 5th Dan Jodo, studying under the direction of Ueda Kayako Sensei, 8th Dan. O'Brien is a two time Bronze Medalist in Iaido, has represented Ireland at the European Iaido Championships and received the Fighting Spirit Award from Oshita Masakazu Sensei at the Masamune Taikai in 2015. He began his study of Niten Ichi Ryū in 2011 and received direct instruction from Kajiya Soke, (12th headmaster of Hyoho Niten Ichi Ryū) in 2014. O'Brien is a dedicated martial artist who began training in the martial arts in 1985. He has been in consistent training since then, studying a variety of traditional martial arts and systems; including Shotokan Karate, Aikido, Kobudo, and more. In addition he has made a serious study of modern martial arts and reality based systems. He has a number of high ranks in these ryū’s and systems and is a recognized instructor. He is also a noted author and columnist and has been writing on the martial arts and other topics for over 10 years. 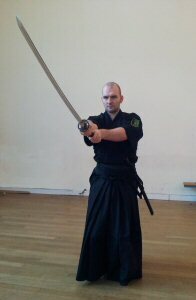 O'Brien is also a former President and Secretary of the Iaido Association of Ireland. He has been authorised to open a study group for Hyoho Niten Ichi Ryū by Takanori Kajiya Soke, 12th headmaster of the school. John Kennedy holds Nidan (2nd Dan) in ZNKR Iaido and is a student of Peter West, 7th Dan Kyoshi, studying the Harasuke-ha line of MJER under the direction of Oshita Masakazu Sensei, 8th Dan Kyoshi. Within Jodo Kennedy holds Nidan (2nd Dan) and is a direct student of Elena West, 5th Dan Jodo, studying under the direction of Ueda Kayako Sensei, 8th Dan. He received direct instruction in Hyoho Niten Ichi Ryu from Kajiya Soke, (12th headmaster of Hyoho Niten Ichi Ryū) beginning in 2014. Kennedy has represented Ireland at the European Iaido Championships in 2016. 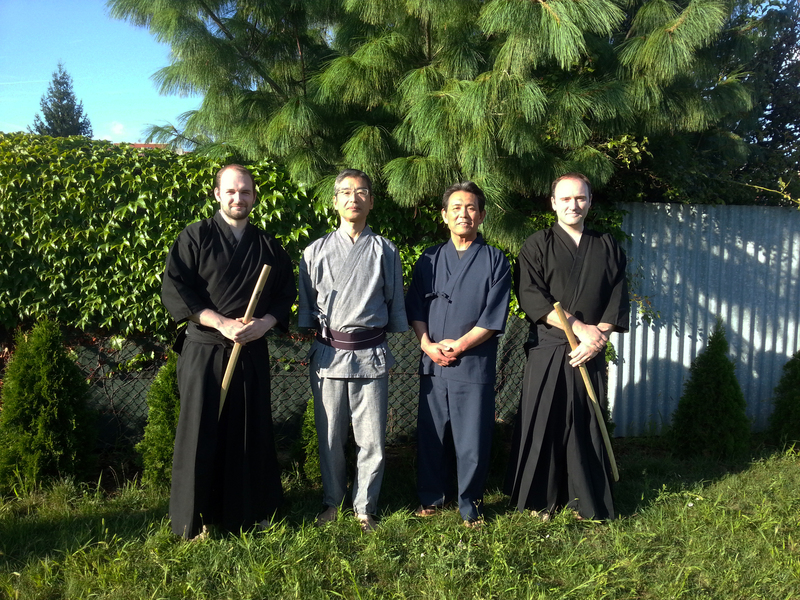 Batman O'Brien, Kajiya Soke, Shuri Sensei and John Kennedy; Slovakia 2014. Batman O'Brien performing a 'men' cut. Batman O'Brien practising a bo form with Kajiya Soke, Slovakia, 2014.